Scene from the feature-length film “Sudsy Slim Rides Again,” from Tundra cartoonist Chad Carpenter. After playing for five weeks at the Valley Cinemas, "Sudsy Slim Rides Again" rides into town for one night only – Friday – at the University of Alaska Anchorage. It's the sophomore effort from Alaska cartoonist-turned-filmmaker Chad Carpenter, whose "Moose: The Movie" played to packed houses in the Valley and Anchorage in 2015 and even enjoyed a limited release in the Lower 48. This time he's trying something different. "Moose," he says, was written more for locals. 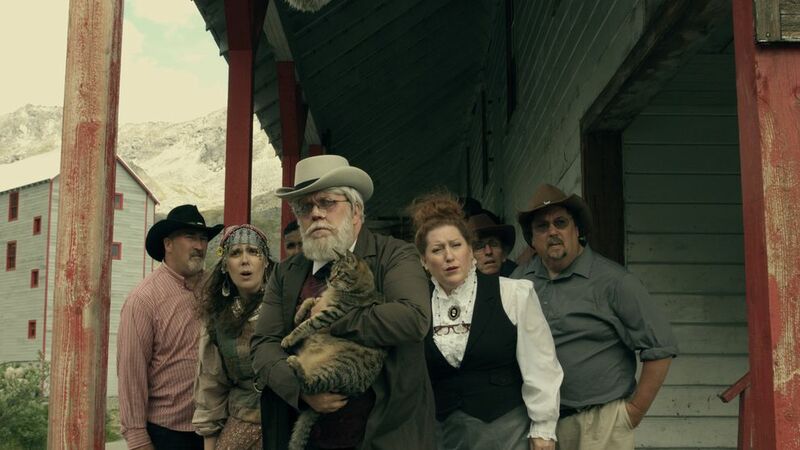 "Sudsy" is an attempt at semi-serious filmmaking aimed at appealing to viewers beyond Alaska's borders, even though its title character is obviously based on the notorious Skagway con man Soapy Smith. At heart, it's an old-fashioned oater in the tradition of "square-jawed lawman comes to small town to set things right." In this case the lawman is Agent Sherman (Raymond R. Chapman) of the Alaska Bureau of Criminal Detection, following up on a frantic missing-person call from the remote town of Scratcher Pass. The person who disappeared happens to be a guy who's been dead for a century: old-time miscreant Sudsy Slim, whose mummified corpse is a tourist attraction. 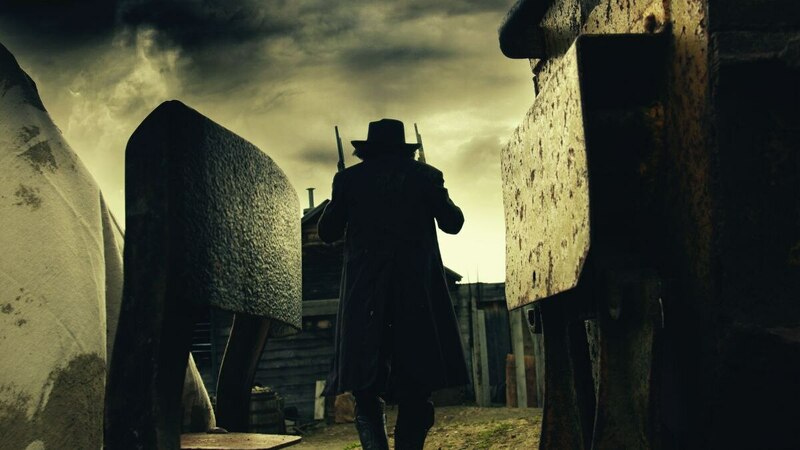 The dead dude is the only thing keeping this struggling mining town afloat. Without him, they're doomed. Agent Sherman reluctantly takes the case because he needs to keep a low profile after a professional mishap involving a serial killer and a cat named Mr. Tibbles. (Like we said: semi-serious filmmaking.) As a cop, he has a hard time believing a corpse would leave its coffin and attack townspeople – yet that's what the crime-scene evidence suggests. Is this the beginning of the zombie apocalypse? Carpenter came up with the idea while driving through the high lonesome between Fairbanks and his home in Wasilla – the same stretch of highway where he dreamed up "Moose." He calls the new film a "spaghetti Northwestern," which is a good indicator of the level of humor involved. Andy (played by Joseph LeCompte) explores a mine shaft as the corpse of Sudsy Slim looks on. Put another way: Someone has to keep the bar low, and Carpenter and his screenplay-writing twin brother, Darin, are the guys to do it. Some of the cast from "Moose" return, both as main actors and as extras. Sharp-eyed fans will glimpse the first movie's leading lady, Chantel Grover, in a tourist group and head ranger Dave Nufer as the sleepy pilot. Zack Lanphier, who was ranger Zack del Pollo, is nearly unrecognizable as Burt, a mustachioed and bulked-up convict. Joseph Le Compte, who plays Burt's timorous and brushy-haired sidekick, is completely recognizable: He looks exactly like the hippie and the redneck he played in "Moose" (although his fashion choices are different). The experience was "a blast," says Le Compte, the only actor from Outside. As with the first movie, Alaska is the real star. "We showcased the beautiful scenery of Hatcher Pass," Carpenter says. Since the title character was based on Soapy Smith, he initially dreamed of making the movie in Skagway, in the summer. That quickly proved impossible, given the annual influx of tourists in that town, plus the need to transport and house the cast and crew. Instead, most of the filming took place at Independence Mine and in a second set of privately owned buildings above it. Additional scenes were shot in Sutton and Wasilla. The filmmakers worked with what they had, stretching precious dollars – and decent weather – to the utmost during the 35-day shoot. "It's kind of like being in a race, except you're building the car as you go," says director Logan Drellinger, a Palmer native who studied and worked in film in Los Angeles for a few years. Filmmaking is an expensive proposition, but local companies like the Grandview Hotel (which housed Le Compte for several months) and Humdinger's Gourmet Pizza Co. (which cooked on-site some days) stepped up. So did a ton of well-wishers: One-third of the $150,000 budget was covered through a Kickstarter campaign, and another $25,000 came from people willing to pony up $50 to get mentioned in the credits. Carpenter claims the rest of the money came from a successful argument with his wife: "I convinced her that our children don't need to go to college." Yet if this film does as well as its predecessor, the kids will be alright: "Moose" officially went into the black eight months after its April 2015 release. Part of that was due to his loyal local fan base, he says. However, "all those stupid reality shows" have made Alaska a hot topic Outside as well. Does that mean there will be a third film? "Yeah, I'm afraid there's gonna have to be," Carpenter says. He already has some ideas – and he'll have to drive to Fairbanks sooner or later. SUDSY SLIM RIDES AGAIN, a movie made entirely in Alaska by Alaskans, will screen at 7 p.m. Friday, June 22, at UAA's Wendy Williamson Auditorium. Filmmaker Chad Carpenter will be there to introduce the movie and to fling "Sudsy"-related door prizes toward the audience. Tickets are $10, available at the door and online through TBA Theatre.